There are so many versions of the good and the bad. You know, is the glass half full or half empty. The issue being how do you live you’re life, living in the positive or the negative. Life isn’t that simple. We must deal with the positive and the negative every time. We can’t ignore the negative when good things happen, and we can’t dwell in the negative but should search for the positive. 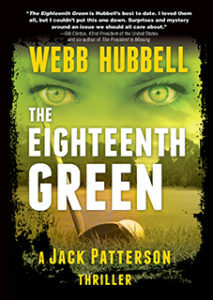 The reason I’m thinking about this is my latest novel, “The Eighteenth Green.” arrives from the printer today. I am very excited. The early reviews have been great — calling it my best, but the negative is that boxes and boxes of books will arrive at my house today, and yours truly will spend the next week or so fulfilling preorders. Again the good news is people preordered books, but the bad news is I must change hats from an author to a shipper. Now most authors don’t fool with selling their own books certainly a positive, but they also don’t get the individual contact with friends and new friends who want an autographed book for themselves, a family member, a friend, a boss, or employee. I get to learn a lot about my purchasers. It’s like running a mini bookstore. As an aside, I came very close back in Arkansas in starting a bookstore called Webster’s. That lifestyle would have been certainly different than going to DC. But back to my point, many things have a positive and a negative, a yin and yang. My meditation this morning worked on this concept. If something is positive, I must recognize that there is a negative there as well, but the positive more than outweighs the negative. The other way to look at things is that if the negative appears overwhelming, I should look for the positive and it will always be there, sometimes hidden, but there. Maybe the concept of the glass half full is to focus our energy on the positive, accept the negative as a price to pay, and continue living our lives on the full side. If I send you a book “On the Brink of Everything “ will you take the time to read it? It’s short but full of good ideas for the Pew. Your bud, Rainer Please ask Suzy to call Roz about a future rendezvous! Rainer. I’d love to read anything you recommend. I’ll remind Suzy. W.